A humble Chinatown institution incubates much of Hawaii’s hair-styling talent. Leo Williams has probably had his fingers in your hair. At least vicariously. As the owner and director of the Hawaii Institute of Hair Design, Williams has trained perhaps 80 percent of the barbers and hairstylists in Hawaii. 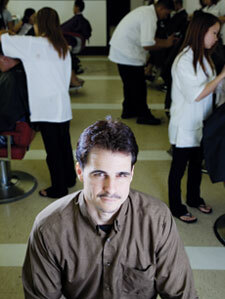 His former students work in almost every barbershop and salon in the state. They’re meting out $200 haircuts in high-end salons; they predominate in countless Super Cuts and Fantastic Sams; and they run most of the old-fashioned two and three-seat barbershops scattered thoughout Island strip malls. To get their licenses, all of them spent at least 1,500 hours—10 months—under Williams’ patient tutelage. The school was founded in 1942 by Williams’ grandfather. About 40 years ago, his mother and father moved the school to its current location: in an old building on North Hotel Street. And while he’s still in his thirties, Williams has been teaching there for more than 18 years. Up on the third floor, Williams’ mother, Margaret, manages the school’s administrative offices—and serves as a mother hen to the students. The tagline on an old brochure calls the school’s program “The Scientific Approach,” a system that has its roots in the precision cutting techniques developed by Vidal Sassoon in the 1960s. Students spend two months in class, practicing those techniques on mannequins, and learning some surprisingly complex material on chemistry and disorders of the skin. But the heart of the school is the bustling, ground-floor salon, where Williams presides calmly over dozens of student hairstylists, three or four instructors and hundreds of customers a day. The allure of working indoors, with air conditioning and all those young women around, convinced Pham that hairstyling was the profession for him. At first glance, the school seems like any other salon. Customers wait patiently up front, reading the labels of the hair products in a vitrine. The requisite Wahl Clipper Co. poster is tacked to the wall. At the back of the salon, a row of elderly women doze under hairdryers. And, as usual, the music’s loud and there’s the faint stink of hair straighteners and coloring chemicals. The salon has a utilitarian look to it—more like a large barbershop than a fancy spa—but it’s scrupulously clean and unusually busy. There are more than 30 chairs, but, because there are usually more students than that, none of the young stylists have their own stations. Instead, they carry their equipment around in little black briefcases issued by the school, setting up shop on the counter behind each client. The students joke among themselves, but they seem serious about their work. Tuition is over $8,000—most of the students rely upon financial aid—so it’s a big investment. Still, they sometimes get bored with the endless parade of men’s fades and the standard cut-and-color. So when a burly young man with a mop of magenta hair settles in and asks for a fauxhawk (a cross between a Mohawk and a pompadour), they drop by to watch the action. Young hairstylists get ahead—ahem—with instructor Sandra Malunay. Because they get so much practice on the mannequins, even the newest students are surprisingly competent, and it’s rare for a customer to leave the salon with a bad haircut. Williams and his instructors constantly prowl the floor, inspecting every haircut before the customer leaves. Students feel “they always have a backup. I can pretty much fix anything,” notes Williams. Throughout the day, students walk up to him and quietly hand him their shears and comb to indicate they’re ready for him. Sometimes, they’ve finished and are ready for his inspection; sometimes the haircut has overwhelmed them part way through and they need his help. In either case, he calmly steps in, praising good work, correcting mistakes and demonstrating alternative techniques. Despite the close supervision, students are given a lot of freedom. Even the students still working on mannequins on the third floor are expected to come down to the salon on Fridays and Saturdays to practice on real people. But rather than paying customers, they work on models—friends or people they lure in off the street with the offer of a free haircut. Students are expected to learn every aspect of hairstyling, and have to master cutting hair with shears, clippers and razors, as well as the fundamentals of color and highlights, straightening and perms. Each student also spends at least 40 hours at the front desk—practice for the business side of hairstyling. And before they can graduate, they’re expected to perform a dozen shaves, each replete with the hot towel, bristle brush and straightedge razor of an earlier era. Students work with five to eight customers a day, six days a week. Toward the end of their training, when they begin to work faster, they might see as many as 10 clients a day. It’s the school’s job to attract all those clients, most of whom come for the low prices. A basic haircut is $5.50; a perm and cut starts at $19.95; color begins at $10.95; and you can get highlights starting at $5. “It’s like a community service,” Williams says. “Clients can pamper themselves for a reasonable price. Standard salons are double to triple our prices.” The fees are just enough for the school to pay the rent for the salon, ensuring that there will be enough clients for the students. Like Sithammalat, most of the students are part of a young, hip crowd. Many have spiky hair and studs in their lips, but it’s still a diverse group. Danz Pham is a tough young boxer from Waianae who wears his hair in a short, tri-color fade. Before he enrolled, he was working in construction behind the school. “I was a bad boy,” Pham says. “I used to come in and cruise the students.” But the allure of working indoors, with air-conditioning and all those young women around, convinced him that hairstyling was the profession for him. “Besides,” he says, “I used to cut hair all the time at home. All Waianae boys cut hair.” He still flirts with the girls, but it’s mingled with kibitzing on coloring techniques. Leo Williams has taught many of Hawaii’s hairstylists—everything from how to hold a comb to how to run a business. Stewart Crockett graduated three years ago, about 20 years after his father, Donald. Donald and his wife own two Fantastic Sams, one in Wahiawa and another in Mililani, so it might seem natural for Stewart to join the family business. “Stewart basically grew up in a salon,” Donald says. Even so, Stewart didn’t envision himself as a hairstylist. “I never thought I could do it,” Stewart says. “It looked hard.” Then, Donald introduced him to Williams. In the salon, Williams checks on the student’s work. Her client has chosen a mod Japanese hairstyle called an “octopus” and students gather around as Williams does the final touches. Working his thinning shears like a razor, he carves the upper layers of the client’s hair until it seems to cling tightly to the shape of her head, leaving the long ends to flare down around her shoulders like tentacles. The students nod their heads at his technique. When he finishes, the customer exclaims, “Ooh … Sassoony!” But Williams has already moved on, his eyes scanning the salon for the next student who needs help.